Boy did it get complicated finding a post-able version of this trailer. Please watch it so that I feel the effort was worth it. 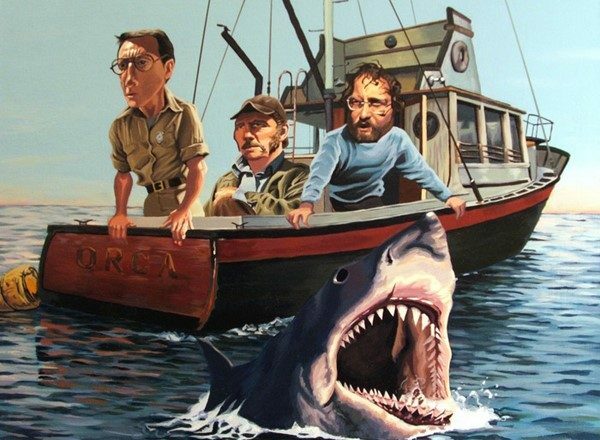 I don’t know why someone doesn’t have it on youtube, because this movie stars Harrison Ford, the biggest movie star on the planet for 20 years, and Gene Wilder one of the best loved comic actors of all time. 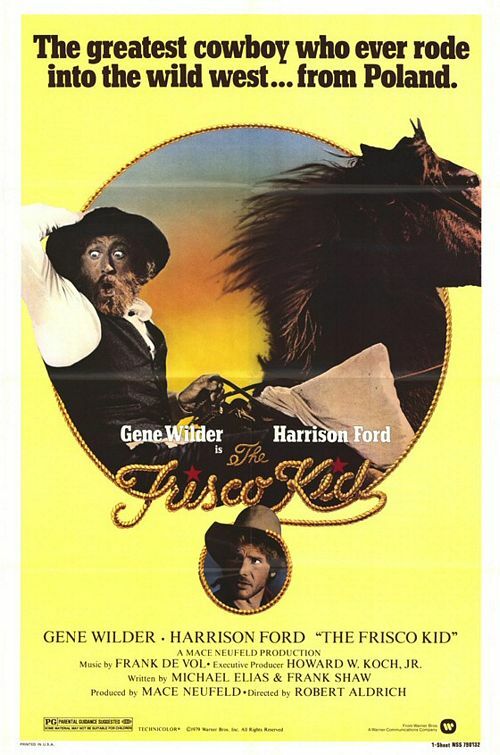 Even though it features these two big stars, I don’t think many people know of or have seen The Frisco Kid. This is another gem from the summer of 1979. There were quite a few other films out that summer so maybe it simply got crowded out of the marketplace. This movie was directed by Robert Aldrich, one of the great tough guy filmakers of the sixties and seventies. He brought us “The Dirty Dozen” and “The Longest Yard”. So it was not put together by amateurs. We saw it at the Gold Theater in Alhambra; that was the small second screen at the site of the main Alhambra Theater. They claim to be the first multi-plex in the country or at least on the west coast. That theater was heavily damaged by the Whittier narrows quake in 1987, and it never reopened. Four years later the Edwards Atlantic Palace opened and it was the most beautiful theater in the world for a couple of years. Now my kids that went there with me when they were little, think it is creepy. If they had ever seen the Gold Theater they would have freaked out. It had a small screen, maybe 150 seats and a pretty low ceiling. That was the experience we had when we saw this movie. It was on a double bill but I can’t recall right now what the other feature was. We loved Gene Wilder and if you look at the trailer, you will see he was the selling point for the film. Harrison Ford had been in Star Wars but not yet the sequel where he really shined and this was two years before Indiana Jones. He was co-billed but definitely the second lead. The movie is populated with familiar faces from westerns and TV shows of the day. There is a an Indian chief played by the guy who was John Travolta’s father in Saturday Night Fever; you know the one who hits his hair. The head of the Jewish group in San Francisco is someone I’m sure I saw on TV a million times in the 1970s. I want to give special notice to William Smith however, because this may be the most memorable role I saw him in in a theatrical film. He is the heavy, and that was the part he usually played. I remember him best from the two Rich Man, Poor Man Mini-series of the 70s. People who have grown up in a world of cable series that had short runs, may think that this was a normal way to tell a story. In the 1970s, when most people had only the three main networks to choose from, and a series might run several nights in a row or over the course of a few weeks they had huge ratings. William Smith was the scary bad guy in the Rich Man, Poor Man series, so he was seen by huge numbers of people and he was quite memorable in the role. 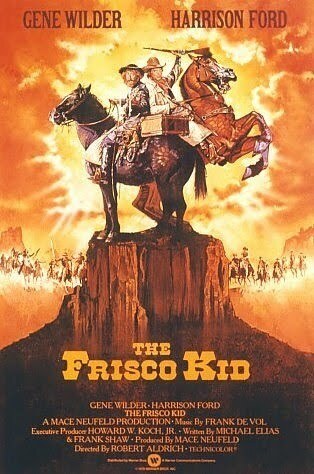 In the Frisco Kid he plays the bad guy that tries to get the Rabbi in a gunfight at the end of the movie. He might be hard to find since the Rabbi took San Fransisco and the bad guy gets everywhere else. Harrison Ford plays his part for laughs for the most part. He is not doing slapstick but he is often the straight man in the comedy duo. He does get a few choice lines and gets to play some very nice emotional moments with Wilder. The heart of the movie is the friendship that springs up between Ford’s bank robber and Wilder’s Rabbi. It is a buddy picture with a nice twist. It is also a fish out of water story, with the Rabbi encountering con men, Amish, posses, and Indians. For a nice Jewish boy from Poland, it would appear to be overwhelming, but the spirit of the Rabbi is a good one. He is a man trying to live up to expectations, and he doesn’t always have the skill but no one would ever doubt his heart. When he telegraphs back the money that Ford stole from a bank in a small town they went through, you know this is a guy with his heart in the right place. Gene Wilder carries the movie with his spot on accent and hangdog expressions. He puts more emotion in his eyes then ten other actors could muster. True his lines are sometimes delivered like a stereotype, but that is part of the humor from being out of place in the old west. If you don’t laugh at the whole sequence when he is chasing a prairie chicken down to when he finally meets up with Ford, there is nothing you will find funny in the movie. I laughed hard at the line”If you had been here yesterday, we could have had chicken.” I think the movie was sold as a Mel Brooks style comedy, but it is actually much more gentle and sentimental. Allison said today that this was her favorite Gene Wilder Character, and she loves Willy Wonka and Young Frankenstein. The movie could be a little tighter. It feels about fifteen minutes too long. It is not a bad fifteen minutes, and I want to be honest, the extra time with the two characters is not going to hurt anyone.